In the previous section we followed Anubis and the rise and fall of the Egyptian gods. Anubis, recognizing his own mortality was upon him, left Egypt at the beginning of the reign of Akhnaten, hoping to find that far and mysterious country where lay the original source of godhood. 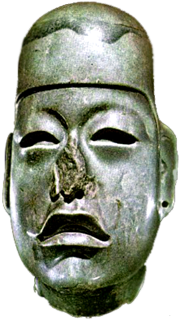 The Olmecs have been one of the great mysteries in Central American studies. For long it was thought that the Mayan culture was the 'mother culture' of Central and South America. Only slowly was it accepted that this title rightly belongs to the Olmecs. Their culture seemed to spring fully formed from nowhere about 1200 BC, hundreds of years advanced over any other culture in the New World, eventually giving rise to writing, monumental artwork, pyramids, and an intricately developed religion based on wer-animals, most especially the wer-jaguar. Yet the key to their culture is the realization that the impetus for their flowering came from one being – Anubis, the soul of Egypt. Anubis had set sail from Egypt on reed boats and let the Atlantic currents carry him where they would. He had no compass or destination, but he could read the stars and knew the direction and approximate distance he was traveling. Yet his arrival in Barbados and then Oaxaca, Mexico could not have been less mysterious to him than the voyage of the dead into the afterlife – a voyage that he had come to fear soon awaited him, and he dreaded it immensely. No one who has pretended to be a death god wants to meet the real one, and despite the hypocrisy he had lived, he believed in the reality of the image gods. This landfall in Oaxaca is another of the great happenstances in the history of 'wer' – a confluence of coincidences that cries out for causality – for a hidden hand writing history to its own ends – the ocean currents, the Olmec, the jaguars, the vampire bat, blood and rabies; they all conspired to change the world. It has been supposed by many inquisitive minds that the pyramids and other features of Mexican cultures had for their inspiration Egypt. In 1970 Thor Heyerdahl built a reed boat, named Ra II, and set sail from the Port of Safi, Morocco, some three hundred miles south of the Straits of Gibraltar. In fifty-seven days the oceanic currents had carried him nearly four thousand miles to the island of Barbados in the West Indies, an arc of islands which embraces the Caribbean Sea and points to the Yucatan of Mexico. Anubis made this voyage more than three thousand years earlier. It cannot be guessed how long he spent exploring the islands, and perhaps even the mainland, until he made landfall in Mexico, in the humid lowlands of Southern Veracruz and Tabasco. These shores are a natural terminus of the great mid-ocean rivers. But we know for certain that he arrived before 1200 BCE. It is probable that this one-way voyage occurred many times, fueling the native American civilizations with the cultures of Africa. Perhaps fugitive slaves or enterprising merchants swept away by storms occasionally survived the journey. But never before, or since, had such a distillate of Egyptian culture appeared on the shores of the new world. From one view the very heart of old Egypt had transmigrated to Mexico. There Anubis found a land completely unlike the land of Egypt, populated by a people unlike any to be found in the Old World – a people of short stature with alien faces. These people, the natives Anubis found, like all the American Indians of that time, were, by Egyptian standards, a primitive people. They had lived in the area for hundreds of years nearly unchanged – small villages of fishers and farmers of a primitive corn, for they were primarily an agriculture based society. Perhaps they'd progressed so far as pottery and jade carving. The wolf-god precipitated a full-scale cultural revolution on these natives, the Olmecs, whom he chose for his new subjects for no other reason than that they inhabited the lands on whose shores the Atlantic currents had deposited him. Of course, to them he was a god, of infinite strength and knowledge, able to change from a wolf-headed form to a black, human-like form with strange facial features. 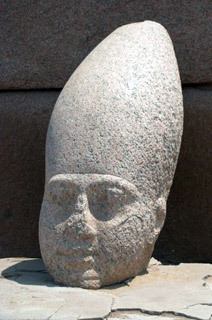 At times, when he took human form, he wore the white crown hedjet, with its large elongated dome shape. 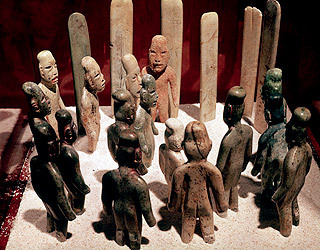 Here are the answers for mysteries that have haunted modern scholars of the Olmec culture. For anthropologists the first hint of the existence of the Olmecs came in 1862 when a colossal stone head was found in Veracruz, Mexico. As time passed, many such heads (from five to eleven feet tall) turned up, most of them made of basalt, and carved with the same features - flattened nose, wide lips, and wearing some kind of headpiece. The question that haunted anthropologists was why the Olmecs, thousands of miles away from Africa, would chisel African features into their stone heads. The answer -- these are simply the normal African features of Anubis in his human form, wearing his crown, hedjet, or other headpiece. Photo at right: Basalt head with African features – a mystery unexplained by overt history. It is an homage to Anubis's African skin and features. It is also possible that many of Anubis's entourage had African features. They would have been instant nobility and probably had a large collection of wives, perhaps infusing the Olmecs peoples with these same features to a noticeable degree. In the photo on the left, the headpiece is midway between the full hedjet crown, and the elongated head that developed from it. That elongated crown gave rise to the practice of cranial deformation of children – an attempt to turn their heads into living crowns. This convention cropped up again and again in the centuries to come. For the Maya, a later derivative culture, this would be a symbol of nobility. In many cases, the crown is reduced to a mere cap, but in others the origin of the headpiece is clearly hedjet. Right: A group of figurines showing the elongated heads, inspired by hedjet and realized by the cranial deformation of royal children by securing the head between two boards that were slowly tightened over the years. Anubis quickly set about 'civilizing' his new subjects – not because he wanted to better their lives, but simply to make them more useful to him and to create a power base, for he intended to establish a priesthood to worship him and a pantheon of gods to give him a long, strong arm to search for his fountain of youth. Thus he gave them the embellishments of civilization – monumental carvings, the notion of pyramids, cities, conquest – Egyptian concepts re-cast in Veracruz style. Overnight the Olmecs leapt forward culturally beyond their neighbors by several hundred years. Anubis did not treat his new subjects cruelly, but they would never be 'his people' the way the Egyptians were, and Anubis was, by his standards, in a hurry – a hurry to find the original source before death caught up to him. He did not directly teach the Olmecs anything he didn't need for his own ends, but simply in his daily living he served as a role model. His hieroglyphic writing inspired the Olmecs to undertake hieroglyphic writing of their own – quite different from Egyptian in detail, since Anubis did not instruct them in a subject he knew required many years of study and really only worked for the Egyptian language. His example inspired them to develop mathematics and a calendar. From him they also learned of pyramids and the wheel, but actual construction of major pyramids would not come until after Anubis had passed from knowledge, and the wheel had no use in Meso-America. Lagoons, swamps, estuaries, hills and chasms, not to mention the endless trees, made the wheel impractical. Pack animals and human slaves simply worked better and were abundant and cheap. All Anubis's policies have to be judged against his goals – contemporary power and renewed life. All his deeds directly or indirectly aimed towards those ends. Anubis quickly began the subjugation of the neighboring peoples and sought out local animals, to be the totem-animal (called nahuales) for his servants. First he would create priests and from them – animal gods. The perfect medium was soon found – the jaguar. It had the right body mass to match with humans, and the power and temperament to be the most powerful predator of the rain forest and the Savannah. Anubis took the jaguar form himself, which sent a thrill throughout the Olmec world. He must have worried about his ability to create godlings, since he had not created any new ones for centuries in Egypt, but urgency drove him to try. In a sense he succeeded far beyond his expectations (creating wer-jaguars capable of the change), which gave him the false hope of having found ''the fountain of youth' – the original source of infection. This success stemmed from the Olmecs' lack of immune defenses to a disease unknown to them. Relative to their immune systems the disease was virulent, and the change did occur – vigorously, which it no longer would in the Egyptians, who'd built up immunity from millennia of exposure. It took Anubis's direct mental intervention – and several decades of training – to create a cadre of wer-jaguars capable of controlling the change, of mastering their wer-animal, but no students ever devoted themselves more completely to their studies. Observe the 'Standing figure of a Wer-jaquar'. [Below left] Look for the godling, and look deeper – you will behold the very features of Egypt's most successful god. His priests – shamans in the New World – became his fanatics, and the wer-jaguars became gods. 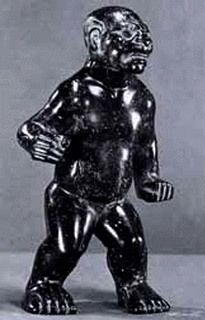 The image of this human/jaguar hybrid became the central theme of the Olmec religion and art. Their likeness appears in countless stone temples in every stage of the change from human to jaguar and every age from child to adult, and often with Anubis's African lips and nose. From the first these wer-jaguars jubilated in blood-letting – no doubt this was due in large to the rabies frenzy, but at the same time, it cannot be doubted that there was a cultural substratum which was an unfortunately comfortable fit for the bloodthirst. The torture and sacrifice of humans, the flaying and wearing of their skin, the ripping out and eating of human hearts, the self-f-immolation and killing of one's own family – these factors common throughout the Meso/South American Indian cultures were the unhappy result of the marriage of Anubis' own blood-is-life-death-and-resurrection cult with underlying religious and cultural attitudes of the people's he found. Although Anubis was repulsed by this extremism, he had neither the time nor interest to try to correct matters. The wer-jaguar cult took off like wild-fire and it might be doubted that Anubis could have changed matters, even had he wished. In keeping with Anubis's second-nature, the jaguar became an avatar of the dead. His godlings shivered in a dark, divine ecstacy at their own changing nature. Their tortured facial expressions, captured in stone, portray the universal shaman's rapture as they move between two bodies, two worlds, two realities, as the shamans had always done. Such magic electrified the Olmecs, but it wasn't the answer to Anubis's quest – his search for immortality. The answer was there, at his doorstep, under his very nose, but he never realized it, for it wasn't the answer he sought – the original source of the rabies virus, the fountain of virulency that would renew his fading vitality. Anubis knew nothing of viruses. He thought only in terms of blood, so he didn't recognize his opportunity, even with a cosmic hint concerning blood. 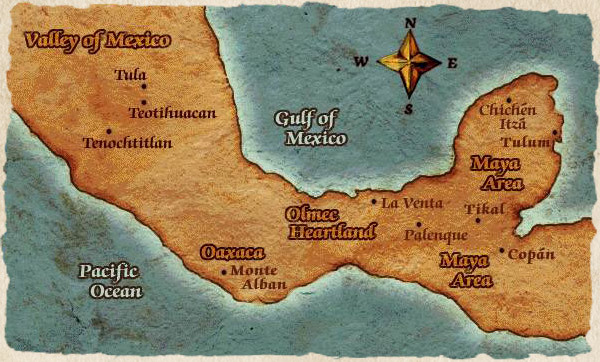 Those ocean currents – the hand of some god far greater than Anubis – threw his ships onto the shores next to the modern state of Oaxaca, the home not only of the Olmec and the jaguar, but also the original homeland of the vampire bat. The vampire – the consummate symbol for, the innocent epitome of, Anubis's blood cult. It is this which cannot be mere happenstance. The vampire bat, such a tiny little jewel of perfection. Only a few inches long, it seldom weighs more than an ounce, often less. Agile night stalkers, like other bats they have a marvelous sonar system that liberates them from the light. 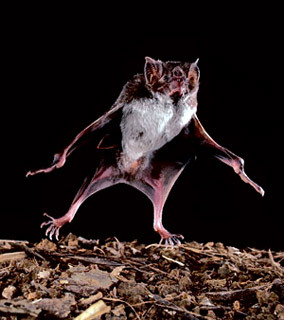 But unlike any other bat they can walk on their hind legs like a human. They can even leap and land standing. How apt, if enlarged, for becoming a human nightmare. But, unlike any other animal, they can carry the rabies virus asymptomatically. They can have the virus without the disease. The virus, not harming their bodies, is allowed to live indefinitely in their systems. And this confers a prodigious gift. Though Anubis never realized it, here was the answer to his prayers. Not the original infection, but something even better – a system that hosts the virus without provoking an immune response. This is a crucial fact. It is the immune response that ultimately destroys the virus, coincidentally terminating the host. Without an immune response the virus is never killed, but lives on and on symbiotically, and so the host lives on and on. Clearly Anubis never tried to capture the bat form, although his priests tried repeatedly. The bat is much too small for easy success. When a human changes into an animal, all his mass is conserved in the new shape. Movie vampires give no hint of the massive majesty of real vampires. For a jaguar, or even a wolf, this is no problem. The sizes are similar enough that the structures are compatible with a human's mass. At worst the wolf is very large. When the priests of Anubis tried the bat shape, the hapless acolyte perished in agony as his bones broke from his own weight, and he hemorrhaged internally. Or possibly the priests infected the vampire bat with the sacred blood, and the bat, not showing the usual rabies symptoms, was sacrificed or abandoned as useless. Whatever the case, with one exception – Quetzalcoatl – the bat proved unusable, and Anubis missed his chance. Unique among the wer-animals, the bat form confers the very advantage he sought but overlooked – immortality. Yet Anubis still lived when the first vampire, the original batman, was born, but he had no reason to know it was immortal. It was obviously long-lived, but so are all wer. At this point the trail of Anubis disappears. There is no compelling hint in myth or archeology disclosing his ultimate fate. 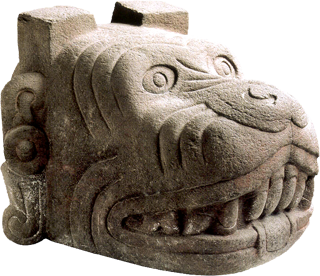 Later Aztec myths speak of Xolotl, called Lord of the Underworld, the dog-headed guide of the dead in the afterlife, who, intriguingly, was thought to be the twin of Quetzalcoatl. The parallel between Egyptian wolf-headed death god and Aztec dog-headed death god is a "happenstance" beyond the possibility of coincidence. No description could more clearly depict Anubis, but the Aztec myth does not tell us what ultimately happened to him. It only tells us that he was intimately connect with Quetzalcoatl, but secondary to him, as we might expect if Anubis's powers were in decline. The last of his original werchildren, the jaguar pantheon, died soon after his disappearance from the record – within a few hundred years. But in diminished form, the disease persisted and spread, and wer-animals became part of the common South American culture. They appear in Incan, Mayan and Aztec art. Throughout history, especially recently, there have been recurrent claims of sightings of genuine wer-jaguars in a part-human part-jaguar state. Next we will meet history's first vampire, who inspired the later Aztec god Quetzalcoatl. For a great online site, see the always worthwhile Wikipedia: http://en.wikipedia.org/wiki/Olmec, be sure to follow the links. Some of my photos were taken from this site. Here is a link to a September 14, 2006 Scientific American article concerning Olmec writing dating to 900 BC and containing some twenty-eight glyphs, which is about 300 years older than any other known writing in the Americas. In case the article should disappear from the web, I quote it below. I have other, longer articles on Olmec writing that I no longer find on the net. The oldest civilization of ancient Mexico and Central America has finally yielded solid evidence of a writing system. Researchers who analyzed a stone block covered in a sequence of faint symbols have declared it the oldest conclusive writing sample from the New World, dating to around 900 B.C. or earlier and belonging to the region's oldest complex society, the Olmec. "Imagine if you will this extraordinary civilization that we've known about for 100 years suddenly to become literate. It gives them a voice in a way that's not directly accessible through artifacts alone," says one of the analysts, anthropologist Stephen Houston of Brown University. He and his colleagues report their conclusions in the September 15 Science. The Olmec, who are famous for having carved heads up to eight feet tall out of rock, held sway in so-called Mesoamerica, along the Gulf of Mexico, from 1200 to 400 B.C. They constituted a major civilization, having several large cities and outposts as well as irrigation, iconography and a calendar. 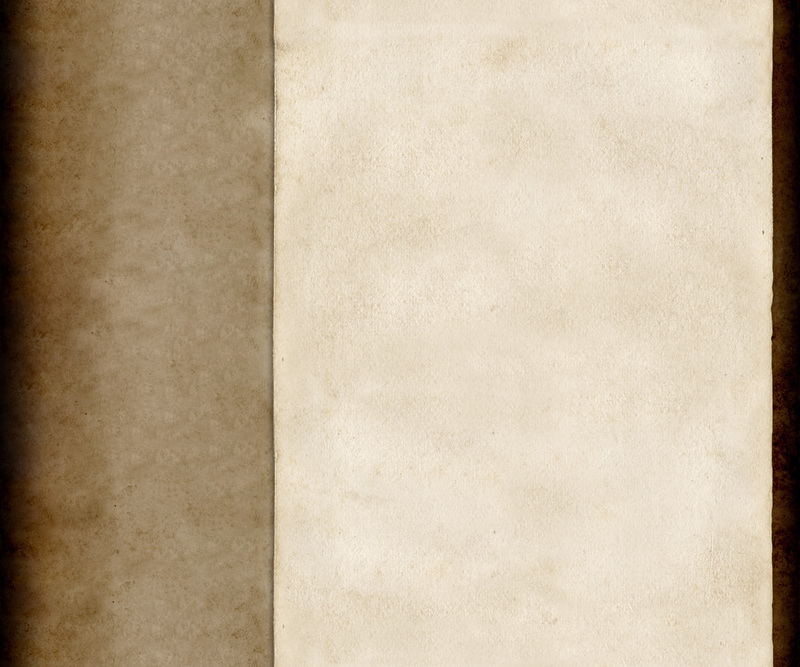 Signs of writing were strangely lacking, however, except for some controversial claims based on limited imagery. The block Houston and colleagues studied was recovered a decade ago from a gravel quarry at Cascajal, part of Veracruz, near what was the Olmec capital. Made of the mineral serpentine, the 36-centimeter-tall block has 62 images carved into it in a series of lines. 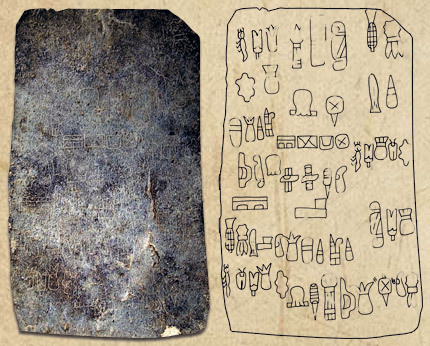 Based on similarity to images in Olmec iconography, the researchers dated the block's inscription at 1000 to 800 B.C. "We think it's writing because it's linear," Houston says, and because of the way the images are organized. Many of the shapes, which tend to resemble corn, insects or man-made objects, are repeated up to four times in the sequence. Several pairs of images crop up more than once, suggesting to the researchers a common feature of Mesoamerican languages called a poetic couplet. Although such inferences remain speculative, other experts are convinced the markings represent writing. "This is cool," says William Saturno of the University of New Hampshire. "We now know definitely the Olmec had a fairly developed writing system. It's something we thought should exist, but we've never seen it." An Image God is any god created by humanity that does not have a living embodiment – the Norse gods, the Greek and Roman gods, the Hindi gods etc. etc. etc. In this website an Image God always refers to an Egyptian animal god, independent of any living god by the same name or with the same attributes. The Image Gods existed before there was any living embodiment of them, and when, beginning with Wepwawet, it became possible for a human to be become a god, to take on both animal aspects (the appearance) and godlike aspects (apparent immortality, enormous strength, magical powers), the Living God was always created in the image of a god that already existed in the myths of Egypt. This Living God then became a 'True God' taking on all the heritage of the mythical Image God plus all the advantages of being a living being. But in a way he was only a shadow of the Image God, because if he were to die, the Image God did not die. It was only as if an avatar, a physical embodiment of the god, disembodied and returned to his other world home. Later this Image God might re-embody. It would, of course, be an entirely different human, taking on the aspects of the Image God to become the Living God for perhaps a century or a millennium, but eventually, when he too passed, the Image God would continue unfazed by the passing of his temporary incarnation. Happenstances – events which could be called coincidences in that they seem related, but no causal connection can be found. Sometimes such events seem too amazingly coincidental to accept as truly unrelated, even though we cannot imagine how they could be related. It is my intuition, and my belief, that most such mind-boggling co-occurences do have some causal relationship, and I can only appeal to the 'hidden-hand-behind-the-scenes-of-history' hypothesis. I don't offer any details (I don't know of any details), but I vaguely imagine something like guardian gods, or Gaia or Those Who Wait being the hidden hand in the long task of nurturing humanity forward to its destiny as godlings and beyond. In these pages when I use the word 'happenstance', I mean it is officially and traditionally accepted as a coincidence, but I am not buying into that reality. I append this anecdote - which, in a way, reveals the ambiguity of my happenstance concept. In 1970 I wrote a monograph on Isidore of Seville - who is said to have been the last man who had an encyclopedic grasp of science, history, etc of the world as his culture knew it. (Admittedly in the 6th and 7th centuries there was less to have to know.) In particular I was interested in his Etymologiae - his study of the origins of words. When I got to his claim that the word 'homo', meaning 'man', came from the word 'humus', meaning 'earth' because God created man from clay, I threw his book across the room in disgust (only once since have I treated a book so disrespectfully). Such a statement can only come from such a defective world-view that there is no way to patch it up. Anyway, it is obvious enough that homo (as in 'homo sapiens') and humus (as in 'exhume') have nothing to do with each other. A couple of decades later, I was browsing through the Indo-European Roots appendix in the American Heritage Dictionary (yeah, that is my idea of fun), when I came across the headword 'dhghem', meaning 'earth'. The suffixed zero-grade form (dh)ghmon, meaning 'earth dweller', gave rise to Old English 'guma' meaning man, as in bridegroom (I don't know where that 'r' came from), and also the Latin homo, meaning man (hominid, homunculus). Needless to say, it gave rise to Latin humus, meaning earth. I had to whisper an apology to the spirit of Isidore. He got it right - for the wrong reasons - but right nonetheless, homo and humus are related. Now what are the odds of that happenstance? Was something cosmic going on? This is a lesson to me that it might be possible to overread coincidences (which do really occur - occasionally) into happenstances (my meaning of the word). Saragossa's term for a vague cabal of transhuman guardians, who've taken on the task of shepherding humanity towards godhood. They follow the Principle of Minimal Interference, intermeddling only to the extent they find essential to keep us on some path towards some godhood. Saragossa himself does not know their exact nature (he feels they are somewhere between humans and gods), nor where they reside (if they have physical bodies), nor how they came to be, nor even if they really exist, for he has never had direct contact with them. He merely intuits their existence, or finds traces of their passage by the trail of happenstances without which humanity might not exist, or might not be on a promising path towards godhood. Simply put, he feels they must exist or we would not have made it this far. The Egyptian royalty used a number of different headpieces – crowns – for various reasons (war, religious ceremonies, pomp). 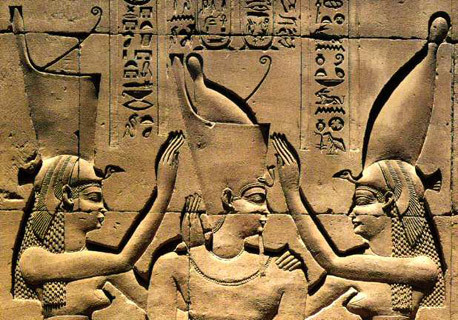 From the earliest days there were two crowns of greatest importance – hedjet, the White Crown of Upper Egypt, and deshret, the Red Crown of Lower Egypt. The White Crown is an elongated cap, which, fortuitously, fits precisely into the open topped red crown to form the double crown, pschent, which represents kingship of all Egypt. It is more common to see pictures of a pharaoh wearing one of the single crowns. There is some speculation that hedjet might have been inspired by cranial deformation among the Egyptian royalty. 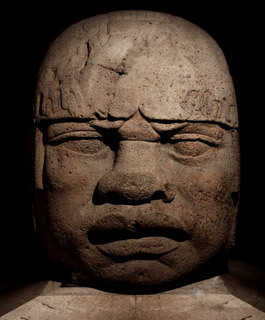 It is nearly certain that hedjet inspired cranial deformation among the Olmec royalty. Many people have no idea that intentional cranial deformation was practiced by any peoples other than the American Flathead Indians, who famously bound their babies' heads between two boards tied together to shape a V, and then slowly (over years) tightened the open end in order to give the children a 'beautiful' conehead appearance – a practice in the name of aesthetics scarcely less extreme than the traditional footbinding of pre-twentieth century China. But the fact is that cranial deformation, both intention and 'natural', has been astonishingly wide spread over millennia. 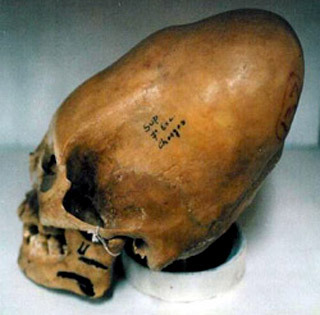 Here is a link for an interesting (and controversial) site with some astonishing photos of skulls showing what is called dolichocephaloidy ('coneheadedness'). The site (although not the article), does not seem very friendly to Darwin (whom I consider one of the great genius of the 19th Century), but it is really quite fascinating, and does mention the Olmec practice of cranial deformation. 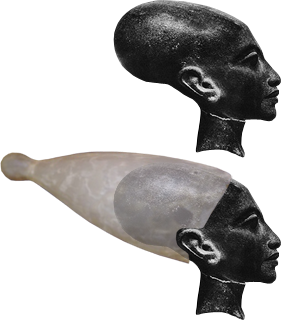 It also alludes to natural coneheadedness in Egypt, including an intriguing photo of a sculpture of a daughter of Akhenaten, showing amazing natural dolichocephaloidy. In short, this brings up the possibility that hedjet, the white crown of Upper Egypt was inspired by natural deformations among the ruling class, and in turn inspired unnatural cranial deformations among people's who held Egypt (or Anubis) in awe. I have no opinion one way or the other about this. Clear views of the hedjet crown, including a stone sculpture of a pharoah wearing it, show how the crown resembles dolichocephaloidy, or 'pointy-headedness'. The 'original source' is the source from which Wepwawet first got his godhood. (See the "Wepwawet" tab in the navigation menu.) This was of course, the blood of the rabid wolf of the Carpathian mountains northwest of the Black Sea – a wolf rabid with WepRabies. (See the tab in the navigation menu called, "The Wer Disease.) But only Wepwawet knew this, and for a long time it was thought by the other gods that the original source was the blessing of a god or a magical fountain. Eventually Anubis realized it had to have been an infusion of the blood of some animal, since this was exactly how he himself made other gods. (See the Anubis tabs in the navigation menu.) Since Wepwawet and Anubis were wolf-gods, Anubis strongly suspected this animal was a wolf, and that the wolf had some sort of rabies, since infusing the godblood into an animal produced rabies-like symptoms and led to a coma. But he had little interest in speculating further since for many centuries he showed no signs of aging or weakening, but indeed, grew stronger with the passage of time. When the other gods began to age, Anubis, in his pride (for though he was a deeply good being, he was a proud one), saw them as essentially flawed in a way he was not. That is, he thought of himself (and Osiris) as inherently more perfect beings. So he still did not turn his mind to this issue of the original source. It was only when Osiris himself began to age, that Anubis realized the truth – that he had lived so long and survived so pristinely only because his godblood had come directly from Wepwawet, who must have received it directly from a god animal. Then Anubis began to think where this animal might live. He knew that Wepwawet had left Egypt a human and returned a god, but he did not know how long he had been gone, nor in what direction he had parted. By 1400 BCE, much more was known about the world than had been known in the days of Wepwawet's youth. Anubis conscripted the armies of Egypt to aid in his quest, but he was looking for a land where other immortal wolf-gods dwelt. It had not occurred to him that Wepwawet would have been the first human in all history to become a god. Nor was it strange to him that the other gods chose to remain hidden, for this was precisely the way of Wepwawet himself. The armies and Anubis failed in the quest, and the idea slowly came to Anubis that he had to pass into the West, which he did sometime between about 1350 and 1250 BCE. When the reed boats he had built took him to a new and unknown continent, he was full of hope. After taming the natives to his will and establishing a priesthood and gods based on the wer-jaguar, he sent them forth looking for the original source – a wolf, of a man-wolf. Interestingly, there is a vague possibility that the phrases 'Fountain of Youth' and 'Original Source or Fount' may be related. Of course, to most of us the Fountain of Youth is associated with Juan Ponce de León and his alleged search for it in Florida in the early 1500s. He is supposed to have learned of it from the Arawak Indians of the Antilles, who told him to look northward to find it. These Arawak tales may be last reflexes of the stories of the search by the wer-jaguars (themselves clearly nearly immortal godlings) as they worked their way northwards from Mexico on the quest of Anubis. It would be interesting to know if they reach as far as Florida. If so, they would not have been the only frustrated seekers of immortality in that state. The Black Sea has been, in its own way, as key to the history of the Old World as has the Mediterranean. It is surround by six countries and a diverse geography. Turkey in the south boasts the city of Constantinople (Istanbul), which for one thousand years dominated any commerce that wished to pass down from the north along the great rivers (Danube, Dnieper, Dniester and the Don) through the Black Sea and on through the Bosporus straits into the Aegean and the Mediterranean. On the west are Bulgaria and Romania with its Carpathian Mountains, the eastern wing of the great Central Mountain System of Europe, which run a thousand miles along the borders of Austria, the Czech Republic, Slovakia, Poland, Ukraine, Romania, Serbia and northern Hungary. They are low and tame compared with the Alps, mostly under 2,500 meters and do not have glaciers. But they have splendid forestation and wild life – not to mention being the home of limitless myths of vampires. To the north and west lie the Ukraine, Russia and Georgia and the great steppes. A totem in magic is something which takes on a specific power by association with something else. (See the "Links" tab in the navigation menu.) In wer-animal lore it means the animal species which is chosen to be infected with Weprabies, in order to harvest its genome and create a wer-animal, ie a human-animal cross. (See the "Wer Disease" tab in the navigation menu.) For example, the bat is the totem animal of the vampire. The jaguar is the totem animal of the wer-jaguar. But the wolf is sometimes considered not to be the totem animal of the werewolf, for the simple reason that it is the original and natural source of the infection, and therefore was never chosen to be infected for the purpose of creating a wer-animal. In shamanism there are magical implications to the choice of the totem animal. The relationship between shaman and totem animal far ante-dates the arrival of Anubis in Mexico. (See the "Anubis & Egypt" tab in the navigation menu.) The jaguar had long been considered an extremely desirable nagual or nahual, that is spirit companion to protect the shaman during his trips between the worlds as he acted in his function as intermediary between the natural and spiritual world. Anubis was at one time the lover of Osiris in Egypt and in all probability the lover of Quetzalcoatl in Mexico. Although there is no evidence to suggest that he ever much expressed any hidden feminine side (assuming such to exist in all men), there are hints that he respected 'two-souled' individuals, who would now days be called transvestites. (Hapi, the god of the Nile, was ambi-sexual.) The following quote from Wikipedia is of interest along these lines with respect to 'two-souled' men and magic, especially shamanism. This quote is from the same Wikipedia article on shamanism. All the wer-animals represent the same phenomenon – a human into whose chromosomes a second genome – an animal's genetic blueprint – has intruded via a viral vector The virus comes from a mutant strain of rabies called Wepwawet rabies, or simply WepRabies. The natural host for this virus is the wolf. The wolf which carries this virus is in no way special except that it carries the virus (and therefore has the usual rabies issues, including a heightened killing impulse). This wolf is called a Wepwolf (for Wepwawet wolf). This wolf is NOT a werewolf. It is only when the genes from this wolf are transferred, via the virus it hosts, into a human that the human becomes a werewolf. Xolotl, in Aztec and Toltec mythology was the dog-headed god who led the dead on their journey in the afterlife (Mictlan). This function as guide of the dead is known as a psychopomp ('psyche' means soul, and 'pomp', as in 'pomp and circumstance' is a solemn procession). There could not be a more exact parallel with Anubis, the dog (or wolf) headed guide of the dead on their journey in the afterlife (Amenti). He was said to be the twin of Quetzalcoatl, (See his tab in the navigation menu.) which is an echo, come down through the millennia, of the extremely close relationship that Anubis had with the original vampire, the bat god who gave rise to the later Aztec Quetzalcoatl. It is probable that the two gods were lovers until Anubis died or disappeared, or the two of them left the New World together. Xolotl was associated with the evening star as Quetzalcoatl was associated with the morning star.